Happy Holidays and an early Happy New Year everyone! Hope everyone got lots of good things and love for the Holidays and that you all are ready for 2017! You guys didn't think I would end the year I launched this blog without an awesome post, did you?! 3) My friends - for the og squad from back home for still making it feel like old days when I visit, and also for my new friends for always welcoming me with open arms. My resolutions are essentially basics to just becoming a better me! One of my key pieces for colder weather last year and this year has been Uniqlo's HeatTech Fleece Turtleneck (only $9.90!). Even though my mom always dogs on me for loving turtlenecks so much when I don't even have a long neck (and also a super round face), nothing can stop me from the classic look of a black turtleneck paired with virtually ANYTHING. Just take the examples of Marilyn, Audrey, Olsen Twins, Steve Jobs, and even Drake :) So if there's any one basic I push anyone to buy, it is a black turtleneck that you can always dress up or down. Now, my second favorite basic in my closet took me a while to find the right one: the knee slit black skinny jean. The moment I found my perfect pair at Fashion Q (for $17.99! ), I bought both pairs they had in my size! (Not to mention, the purchase was given blessings from my sister who reasoned that black ripped skinny jeans will never really go out of style). And plus, I was a sucker for the detailed rips at the ankles and how I finally found knee ripped jeans where my knee and the knee rips lined up correctly. For those of you with short-leg-girl problems like me, try knee ripped jeans in petite sizing even if you're above the standard petite height (this is a tip I got from a friend). Whether they are fringed booties, Chelsea boots, lace up boots, or sock boots, a pair of black booties you can run the world in is essential in anybody's closet. Lately, my go to black booties have been my Chelsea boots from Boohoo, Saint Laurent Janis-inspired platform booties from NastyGal, and, my favorite boots of the year: metallic+perspex block heeled sock boots from Ego (pictured). I actually have a pair of black patent perspex booties en-route to my front door this week, but these half metallic and half perspex heels were a steal from Ego for just $18! They are super cute and look a lot more expensive than what I paid in person. 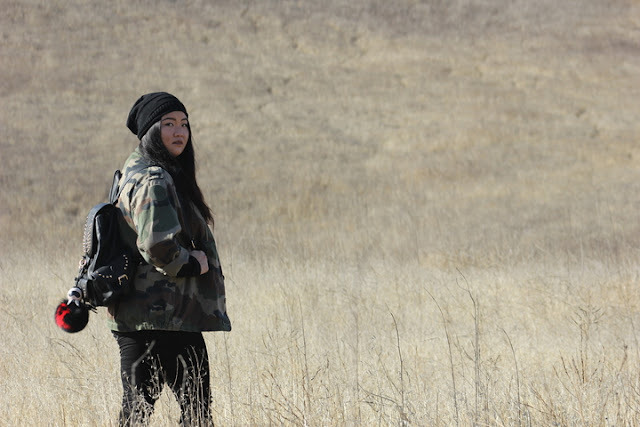 Be it a satin bomber jacket, a patched olive anorak, ripped with back slogan denim jacket, or a military inspired cargo camo jacket, a jacket that's on trend that you are in love with for the year will always make a basic outfit look like you tried harder than you did to look nice for the day. 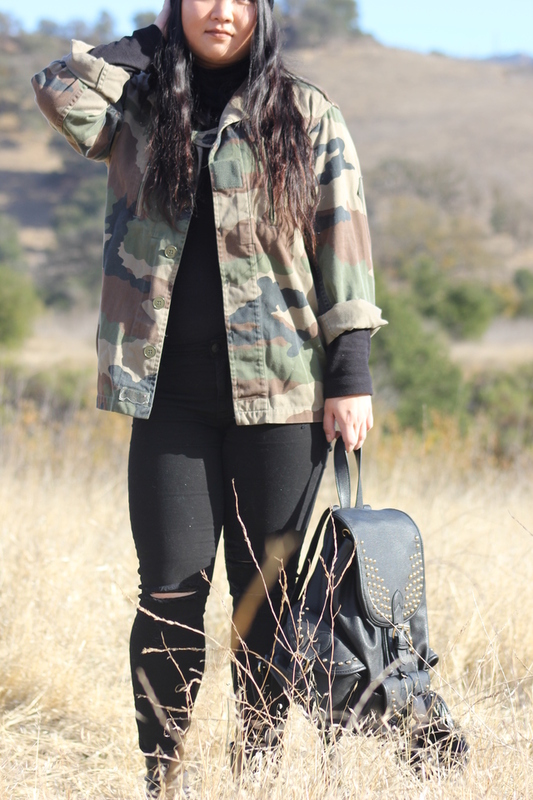 My camo cargo jacket from Urban Outfitters (which I got off Poshmark for just $14!). For the final touch of pop to a seemingly flat and plain outfit, always tote along a bag that can stand out. It can be your favorite coral Celine Trio bag, that red Gucci Soho leather disco, or even a super studded MCM mini-backpack. To go along with my theme of 90's inspired grunge-esque look, I finished my outfit off with a studded backpack from Bebe I bought on sale when I first moved to LA (for I think like $25?) paired with my buddy Karl the pompom. 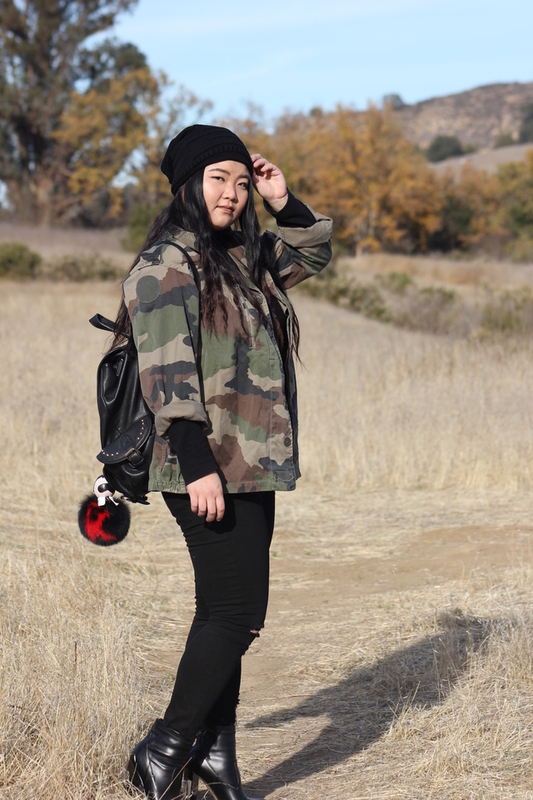 Here are a few options to get my entire look from Forever21, Boohoo, ASOS, and NastyGal! Do you have a go-to look that makes you look like you tried on your laziest days? Comment to share below!! Happy Holidays & Happy New Year Everyone! Cheers to a healthy, prosperous and joyful 2017!!!!! I have discovered my new favorite place to brunch!